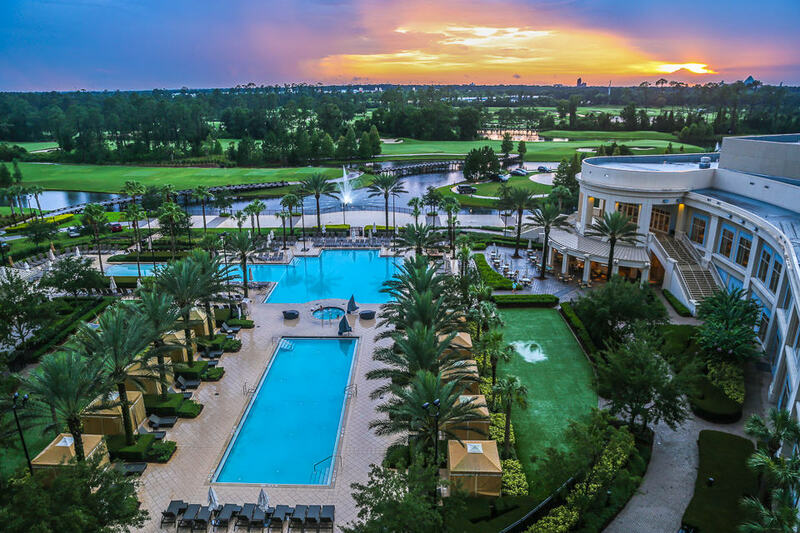 The Waldorf Astoria Orlando is so beautiful, so sophisticated, and so family-friendly, it is just as perfect for a Disney World vacation as it is for a mom spa break or couple’s getaway. The Waldorf Astoria and its adjoining Hilton Orlando Bonnet Creek are within the resort area called Bonnet Creek. 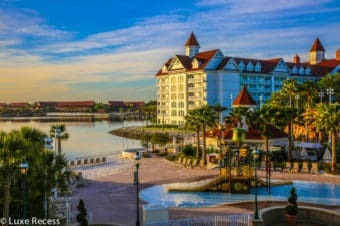 Although the hotels aren’t officially Disney resorts, the Bonnet Creek Resort are located inside the Walt Disney World resort area and your neighbors are the Wyndham Bonnet Creek, the Art of Animation, Pop Century and the Disney Caribbean Beach resorts. A JW Marriott property will open in 2019 in Bonnet Creek. Love the central clock of the Waldorf Astoria Orlando lobby. A champagne check in is part of special event weekends like the Enchanted Evenings during the summer weekends. Love the ceiling of the Hilton Bonnet Creek next door. The Waldorf Astoria takes service very seriously. The staff is everywhere, and are eager to assist with warm smiles. Their service philosophy will feel immediately different from the Disney hotels by providing more formal—yet friendly— service. The hotel’s design is beautiful and fresh, with a nod to peacock blue and tan. The hotel’s art collection is noteworthy and guided tours of the hotel’s work can be arranged. The King Suite living room has an attached balcony and dining area with mini fridge but no microwave. Very impressive hair dryers with concentrators to blow out that Florida humidity. Double Queen rooms are very spacious and can be added on to a King Suite for a luxury family layout. Running from bedroom to bedroom shows how well a family can spread out. Rooms are very comfortable but small details make them memorable: in-room Nespresso machines and T3 blowdryers with concentration attachments (pack your round brush!) to smooth your hair from the Florida humidity. There are refrigerators ready for your own foods and beverages, but no minibars (which is a plus for traveling with kids). I hate dealing with mini-bars attached to automatic sensors. Curious toddlers are too easily enamored by the packaging of mini liquor bottles and $10 glass jars of gummy bears. 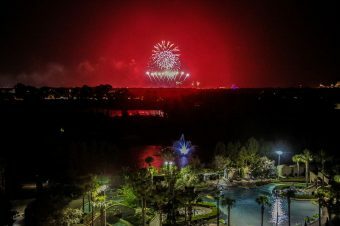 Many park view guest rooms are available, and luckily for the Waldorf Astoria, the best views are of those at Hollywood Studios, now offering some of the most exciting fireworks shows for Star Wars. (Read the review the Star Wars Dessert Party). Bull and Bear serves more formal dinners, Oscar’s offers a daily breakfast buffet, while Aquamarine offers poolside lunch. Combined with the Hilton Bonnet Creek, there are several restaurants on property from sushi to Italian. if we can answer your questions when planning your next Disney vacation. Taking a crudite detox from theme park food at Oscar’s for brunch. This isn’t Disney World coffee at Oscar’s. I have to make special praise for Oscar’s breakfast buffet. It is, again, far nicer than any Disney character breakfast down the road. In addition to covering all of the bases deliciously, I was impressed to see cheese and meat displays more commonly enjoyed by non-American guests, gluten-free baked goods, and a freshly pressed juice bar. You must try the fresh juices like watermelon. Omelettes and waffles are made to order. I loved that I asked the kitchen for a few cut raw veggies to prevent my child from getting scurvy after living on a theme park diet for a few days. They delivered a plate full of crudité as I had asked, and my son immediately knew where two cucumber slices needed to go. Bull & Bear provided a formal dining experience unlike any other I have had at the various luxury Orlando resorts. The service was flawless and attentive, with multiple servers offering a more traditional dining experience. I haven’t tried Victoria & Albert’s yet, but I am sure it is the only other restaurant in the area that has so many servers per table. The neighboring table ordered the house special, the bone-in Tomahawk Steak. Our food ranged from good to excellent, with an entire menu available on an iPad that offered pictures of every selection. 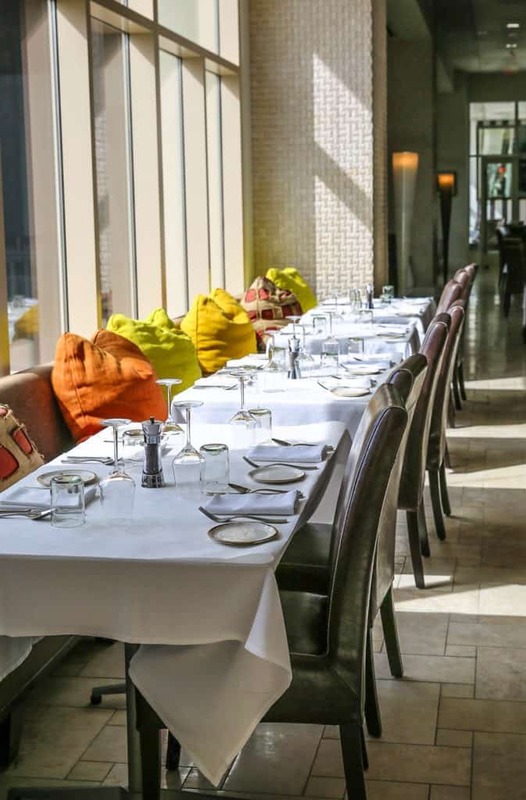 Escargot and gnocchi, fresh burrata and tomato salad, steaks with lobster tail, and signature Moscow Mules made an excellent meal with sunset views overlooking the pool. Read our take on the best Disney restaurants at the parks and resorts. Room service offerings for kids at breakfast were those you would expect. For lunch and dinner, however, I chuckled at what would be nearly $20 for plate of corn on the cob with taxes, fees and gratuities, and I was surprised by their choices: fresh salmon and pasta paired with asparagus and tomato sauce; pan-seared chicken with roasted tomatoes, pesto, and goat cheese. I can’t imagine these children’s dishes being ordered as is—without some sort of modification—but I am sure the Waldorf is happy to oblige your special requests. One must-eat treat was the ice cream at the Hilton Bonnet Creek’s Muse Restaurant. Made by Chocolate Shoppe Ice Cream in Wisconsin, they only serve about 8 flavors, but they were all truly decadent and worth a calorie splurge. The most popular flavor, “This Just Got Serious,” is salted caramel ice cream with chocolate sea-salt fudge and salted cashews. According to a sign on the wall, the ice cream is made with loads of Wisconsin cream and is not low-calorie. You have been warned. The spa and fitness center are solid; the strength training machines are not as plentiful as cardio options. Props include stability balls, bosus, and foam rollers; the only class offered is poolside yoga at 8AM on the weekends, which I could not sample this trip. There is a spa and fitness staff person on a constant rotation ensuring every cardio machine has a towel and bottle of water. The wonderful view of the pool and natural light in the gym make you want to linger a little longer and work a little harder. The locker areas include a jacuzzi, steam room, and sauna, and the relaxation lounge offers teas and granolas. The spa is really large, with twenty-two treatment rooms, and spacious, so it feels much quieter than the more social atmosphere at the Grande Lakes spa for the Ritz-Carlton. The main spa product line is Carita, which I first tried at the St. Regis New York spa, known for its excellent facial product line. Many treatments use a locally sourced Tupelo honey, too, like the Honey Calendula Body Buff. I chose a hydrotherapy spa service after a long workout for something different. I climbed into a stand-alone white Jucuzzi tub, and lay down in the warm water with a choice of essential oils (lavender or lemongrass). The room featured a metallic brick wall decorated with flickering tea lights and fresh flowers. The tub offered a pre-programmed series of water jets targeting different parts of my body: back and shoulders, outer arms, outer legs. I didn’t know what was coming next, just relaxing and taking in the atmosphere. I realized it was the spa version of a Disney ride. But like a Disney ride, it ended abruptly, and you say to yourself, “Again! Again!” I will be eager to try their facials on a future visit, like the Sculpting Gold Perfection Facial. Grab a cabana and enjoy a luxurious day at the outdoor pools. Although the neighboring Hilton Bonnet Creek boasts an excellent lazy river and slight bigger crowds, the Waldorf Astoria pool is calm and tranquil and decadent. Pool attendants will bring special Prosecco-made popsicles with a special flavor of the day, and you don’t have to share those with your kids. At the pool, a stand sells kids’ floaties, toys, goggles, and anything else you left at home. Hammocks, a bean bag toss, and jumbo chess set surround the pool cabanas. 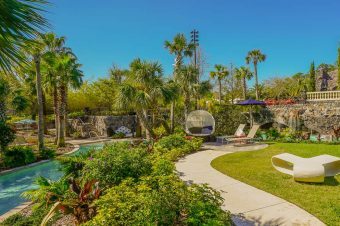 See the pictured zero-entry area of the pool that is perfect for pre-swimmers, and for older children, they will love the lazy river next door at the Hilton Bonnet Creek. Paths are mapped for a complimentary bike or surrey rental to glimpse a bit of the Bonnet Creek’s almost 500-acre nature preserve surrounding the resorts. On my second visit to the resort, I had the benefit of being there for the summer series of special events called the Enchanted Evenings. Special events occur every summer weekend at the Waldorf Astoria and the adjacent Hilton offers its own special event program, including Cupcake Lover’s Weekend, and lucky me, I was there for it all! A mad scientist ice cream bar welcomes kids at check in while mommies got a flute of champagne. Resort scavenger hunts are led by the recreation staff who host kids’ nights out during the weekend. During the Kids Night Out at the Waldorf Astoria, my son painted a piggy bank and made friends. The chocolate bar offered so many different treats that no photo could do the spread justice in Peacock Alley. A great selection of champagne by the glass to go with your chocolate dessert. Aquamarine set up a mediterranean bar for souvlaki style sandwiches made with tandoori bread instead of pita. Enchanted Evenings included special events like poolside games, water walkers, scavenger hunts, poolside treat like a gyro bar at Aquamarine, Spa happy hour with champagne and chocolates, and the incredible champagne and chocolate bar in the Peacock Lounge at night. For the most creative, my son loved the Mad Scientist sundae bar where liquid nitrogen was added to the mixer and children could make their own sundaes. Guests gathered in an event tent next to the pool area for the unveiling of a giant cupcake filled with thousands of cupcakes ready to serve. Every department of both hotels submitted a cupcake display in a decorating contest that guests could vote on, like this Harry Potter Minion cupcake. Staff served gluten free cupcakes , too, which always wins points from me! The Waldorf Astoria never felt crowded during my stay, because most of the guests were at the parks during the day, so the facilities felt private and serene. The lazy river at the adjoining Hilton also retains a relaxed feel. One local mom told me at the gym, “We always come here for our local vacations because the lazy river was designed so well, I can see my kids easily; I can actually relax and chill by the pool.” Yes, moms can just chill here, with or without their kids. 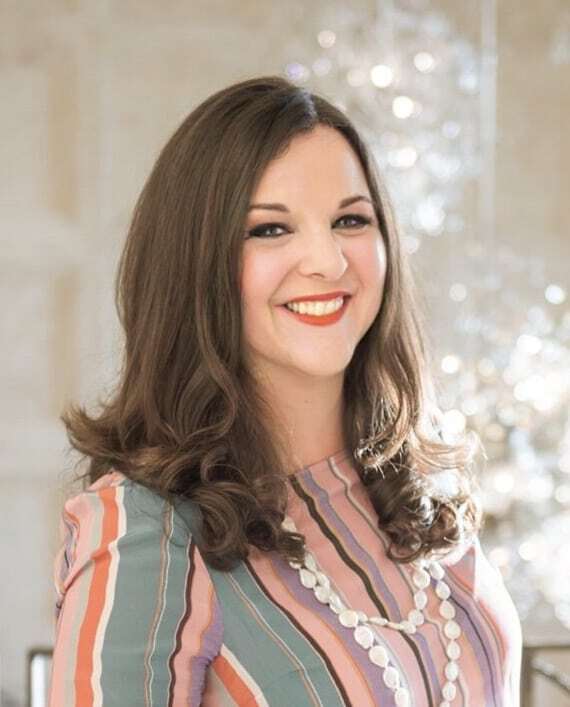 The Waldorf Astoria’s kids’ club operates mostly during weekend evening hours and isn’t open on a regular basis, so I reached out to my favorite Florida hotel babysitting company that I used in Palm Beach called Sitters In A Second, Inc. They sent us Amanda, an amazing sitter who was certified to swim with my son, and she is actually a swimming teacher for children. The days were too hot not to swim, so after a few hours of play in the room, Amanda took my son and friend to the pool and had no interest in me while I was in a meeting a few feet away. Everybody was happy. Sitters In A Second, Inc. is my go-to hotel service in Florida and Southern California. Every sitter we have used has been a huge hit with my kids. Amanda from Sitters In A Second, Inc. was a swim teacher for children so I allowed my son to swim with her. The Waldorf Astoria and Hilton Bonnet Creek share a scheduled luxury motor coach to each park, so there are no mysterious waits. The buses to Magic Kingdom, however, drop of at the Transportation Center and require the monorail or boat to transfer to the entrance of Magic Kingdom. Uber is readily available now, too, for those not interested in waiting. The Hilton Bonnet Creek has a full Disney store inside to purchase and activate Magic Bands with your pre-reserved Fast Passes. 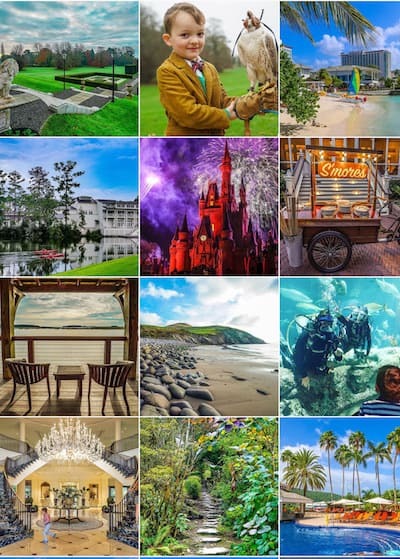 The Waldorf Astoria Orlando is a perfect 5-star resort to stay for families at Disney World if your children are too young or you choose not to participate in supervised kids club activities offered at the other five-star resorts. If you feel like you want something more Disney-esque for the sake of your children, simply order a fabulous princess or Mickey Mouse welcome gift from Disney Floral and Gifts to have delivered to your room on arrival day. The environment is adult—yet completely welcoming to children— and a perfect antidote to the overstimulation one gets at Disney parks and resorts. After my son went to sleep, I snuck out to our balcony and watched the fireworks from Hollywood Studios and noted that one very smart family was watching them from the hot tub at the pool. That’s on my bucket list for next time. Hollywood Studios fireworks seen from the Waldorf Astoria Orlando balconies. Although we were guests of the Waldorf Astoria, these opinions are entirely my own. Check your dates for rates at the Waldorf Astoria Orlando. Sitters in a Second also provided a sitter for the inclusion in this article, but no one uses a sitter service they don’t completely trust…free or not. As a lover of really good hotel spas, I am adding the one at the Waldorf Astoria Orlando to my list! Thanks for the write-up. We love to stay there too! 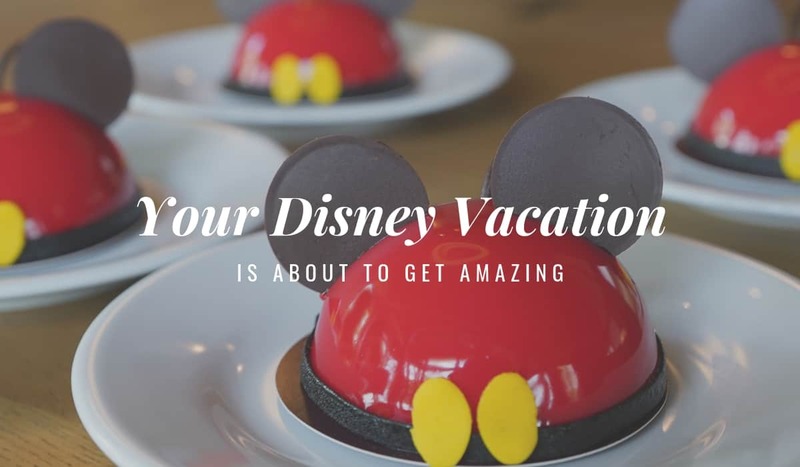 A relaxing retreat from the sensory overload of Disney World! The Waldorf Astoria sounds incredible. That spa treatment, location and rooms all sound heavenly. It really is worth it to venture off property for the reasons you mention, even if it is after a a few days at a Disney World resort. So lovely. I’d have a hard time wanting to leave for the parks!